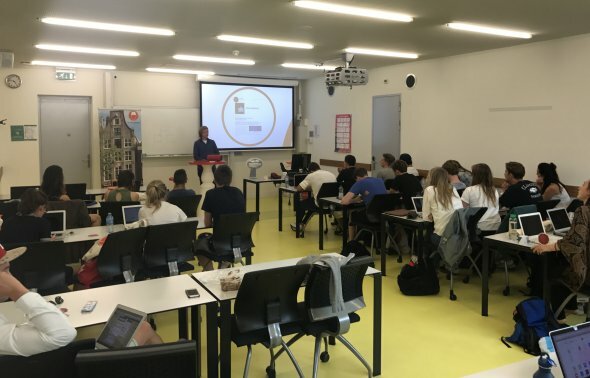 On Monday 29 May, Mr Alphons Geerlings and Sam van den Berg visited the Amsterdam Business School at the University of Amsterdam to give a ‘Talks with…’ guest lecture. Every semester, new students come together to create start-ups in the Entrepreneurship minor offered by the University of Amsterdam. Because intellectual property rights are vital to entrepreneurship, giving a “Talks with…” lecture to these students seems a perfect match. This semester, as in the past, the students are enthusiastic and the ideas are good. The start-ups will make their final pitch at the Impact Hub Amsterdam on 29 June, when the winner will receive prizes including €1,000 worth of IP advice from de Merkplaats and the top 8 finalists will receive a one-year subscription to CC Proof. We’re eagerly looking forward to this event.